The Victorian Cancer Biobank adds value to medical research through experience, efficiency, standardization, accountability and timely dispatching of biological materials. The Victorian Cancer Biobank (VCB) is an open-access, not-for-profit tissue resource established by the Victorian Government, Australia and our partnered health care providers to facilitate translational research. The VCB provides cancer researchers with a diverse selection of high-quality biospecimens and derivatives, comprehensively annotated with de-identified clinical outcome data. The VCB specialises in the ethical procurement, processing, preservation and distribution of clinical grade biospecimens for research purposes that meet or exceed National Cancer Institute (NCI) best practice recommendations, and the National Pathology Accreditation Council (NPAAC) standards to ensure validation through standardization, documentation and quality management. Scientists throughout the world depend on the VCB to supply high quality samples to support high-impact studies, and thousands of people have consented to be tissue bank donors. 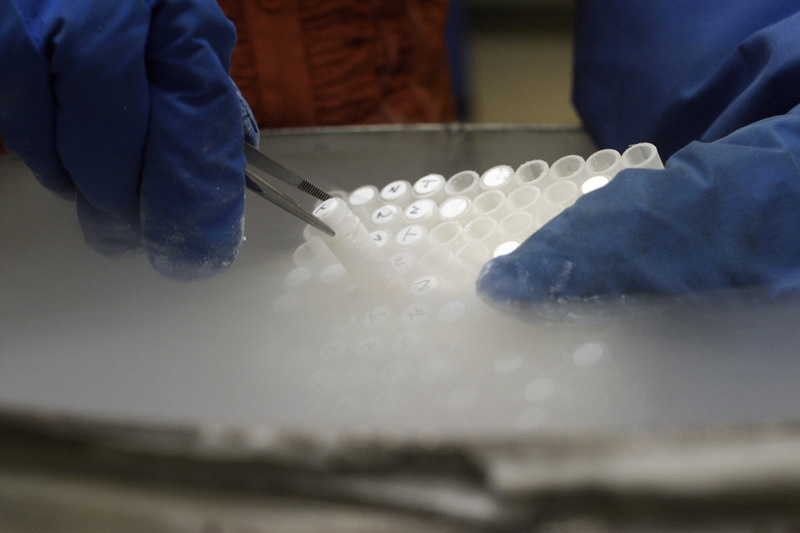 The VCB is only one of a few research-related biobanks that have taken a holistic approach to biobanking by collecting and storing large quantities human biological material matched to corresponding data. Clinical follow up and outcome information is collected for up to 10 years. Operating as a hub-and-spokes collection model with a centralised database across Victoria, the VCB’s success is due to its collaboration with local pathologists, medical oncologists, surgeons and other hospital personnel. Specially trained tissue bank staff obtain patient consents, collect, process and store tissue and blood samples. Clinical pathologists select fresh tissue for research as matched pairs (tumour and adjacent normal) within an hour of surgical resection. The majority of solid tissue samples have a corresponding blood sample taken pre-operatively. Blood samples are also processed and stored within two hours of collection. The VCB’s standard in tissue procurement has made us one of a few biobanks that can support basic, translational and large omics studies across the world. To provide a viable solution for scientists to find the quality and number of biospecimens they need to make world-class discoveries. In doing so VCB accelerates cancer research for the development of better patient diagnostics and therapies that will improve the quality of life for patients and families affected by cancer and other chronic diseases. To be recognised as the leader in providing the highest quality human biological materials for medical researchers. We create and maintain mutually beneficial partnerships to increase the reach and impact of our work. In 2001 a group of Victorian oncologists, researchers and pathologists developed the idea of a coordinated and large scale biobank with centralised access to annotated biospecimens. By 2003 initial seed funding was provided by the Cancer Council Victoria and was used to employ a project officer to coordinate the standardisation of protocols and datasets across four major tissue bank in metropolitan Melbourne. This formed a solid basis for a grant application to the Victorian Government. In June 2006, the Consortium Agreement was signed by four founding members: Peter MacCallum Cancer Centre, Melbourne Health, Austin Health and Southern Health with Cancer Council Victoria as the lead agency. With $7 million funding from the Victorian Government through an STI Grant from the Department of Business and Innovation (formerly Department of Innovation, Industry and Regional Development), the Victorian Cancer Biobank was born. In 2009 the Victorian Government, through the Victorian Cancer Agency, provided additional funding for expansion to regional Victoria, the support of clinical and project specific research and for the implementation of a pathology digital imaging system. In mid-2012 the VCB welcomed the Government’s decision to provide ongoing funding of $14.9 million per annum to continue to support translational research in Victoria through the Victorian Cancer Agency, and in particular, the commitment of $2.3 million to 30 June 2013 to fund the ongoing operations of the VCB and to support our transition towards being an important part of the integrated cancer research platform. In the next 12 months and beyond we will continue to work with the donors from the community, clinicians and cancer researchers to ensure that we provide quality human biospecimens to researchers whose work will lead to improvements in the diagnosis and management of cancer. The VCB represents an irreplaceable resource for cancer researchers like myself. Access to tumour tissues and clinical data is vital in many areas of cancer research. Because of changes to the ethical requirements for the collection and use of human sample it is often not feasible for individual research groups to access, collect and store human samples. VCB handles all these requirements which make tissues available to researchers whilst protecting the privacy and rights of patients. Many clinical studies require access to a large number of samples in order to draw statistically valid conclusions. Even with common tumours, collecting samples and associated clinical data can take years and is beyond the resources of most research groups. In our own case we used samples from >100 patients in a study of the role of three different genes in the progression of colon cancer. The availability of the tissue samples supplied as microscope slides ready for use, access to the clinical data plus expert opinion on the stage and grade of each tumour sample reduced the time to complete this study from years to months. In addition having a centralised repository means that sample are processed and stored under identical protocols making comparing studies from different research groups easier. VCB has accurately and swiftly aided me to obtain human tissue and plasma samples for biomarker studies. VCB played a critical role in the viability of my ongoing study, since VCB was one of the few biobanks having 200+ matched paired plasma/tissue samples from NCSCLC patients available. Guided by the excellent help of VCB, Ethical approval and access to these samples was easy and well- coordinated. Specifically, the possibility for direct communication with the personnel collecting, sectioning and shipping the materials from Melbourne to Utrecht, The Netherlands and Boulder, CO, USA, was of vital importance to the success and high quality of my research project. I would strongly recommend funding of VCB to allow continuation of their activities. The Biobank resource represents essential infrastructure to enable clinician-researchers such as myself to study cancers, which will lead to new insights into cancer biology that while drive improvements in patient care. It continues to be a worthwhile initiative and I support the need for longer term funding to provide security and enable longer term planning initiatives by the VCB. The ability to source tumours from multiple different hospital sites has been particularly helpful in enabling me to obtain adequate numbers of cases for rarer tumour types. I would be interested in providing further pathologist assistance to help the VCB collect rarer tumour types to enable these tumours to also be studied. Funding targeted at providing support for pathology trainees to get further involved with VCB projects would also be highly desirable, as Biobanks should be an integral part of the modern anatomical pathology lab. The biospecimens processed and/or collected by the VCB has been crucial to a number of concurrent projects that are investigating the role of circulating tumour DNA as a biomarker in colorectal cancer. Over the past 4 years, my research team at the Walter and Eliza Hall Institute of Medical Research has received over 8,000 biospecimens from over 300 patients diagnosed with colorectal cancer; a recruitment rate that could not have been possible without a resource like the VCB. The rapid collection of high quality blood specimens linked to clinical data, has enabled us to explore the clinical utility of blood biomarker in the management of colorectal cancer patients. These translational research projects have resulted in multiple abstracts and presentations in National and International Oncology meetings. Because of the VCB’s open-resource policy, my team has been able to attract research funding from Victorian Cancer Agency and NHMRC. The professional work by dedicated VCB staff continues to be a major cornerstone of colorectal cancer research in Victoria and is a very important asset to the community. I was approached by the VCB to participate in a research project involving colonoscopies whilst at Box Hill Hospital. After having the study purpose and requirements explained to me, I agreed to participate by having a one off blood sample collected. I also answered a questionnaire that the girl provided. I think the VCB was an important part of the process as they explained to me that the VCB help to organize the sourcing of patients and coordinate the collection of my sample to be sent to the research project. The researchers are I believe interstate, so the VCB being here on site enabled me to have the opportunity to help research into medical science. I guess if the VCB had not been in operation then I personally would not have had the opportunity to be part of the study. I like the idea of my sample being able to help others in the future. When I was first diagnosed with cancer in 2007, I never thought about participating in medical research until I was approached by the Victorian Cancer Biobank. When I learned that I had to have surgery to remove a large tumour from my parotid gland, all I wanted was for the tumour to be removed and hopefully have a full recovery. I didn't think or care about what happened to the tissue once it was removed. However, once tissue banking was explained to me, I never imagined the benefits that could result from donating tissue that was left over. I never knew that tissue and blood could be of such value to so many researchers. I had no idea the vaccines against cancer could be developed from studying tissue, or that drugs could be developed to target specific kinds of cancer. I have been disease free now for over 8 years and if it were not for government funded programme like the VCB I would never have equated the treatment options I received to people who may have contributed to cancer research in the past. It was a devastating experience being told I had cancer, so if my small contribution of tissue adds to the general pool of knowledge to find better treatments or cures for other cancer patients, then I am grateful that an organisation like the VCB existed. The VCB made it easy for me to contribute to the public good, and has given me a feeling that I could be making a difference.